I am the sister of the woman in the story who originally had the crosses on the wall prior to the fire. 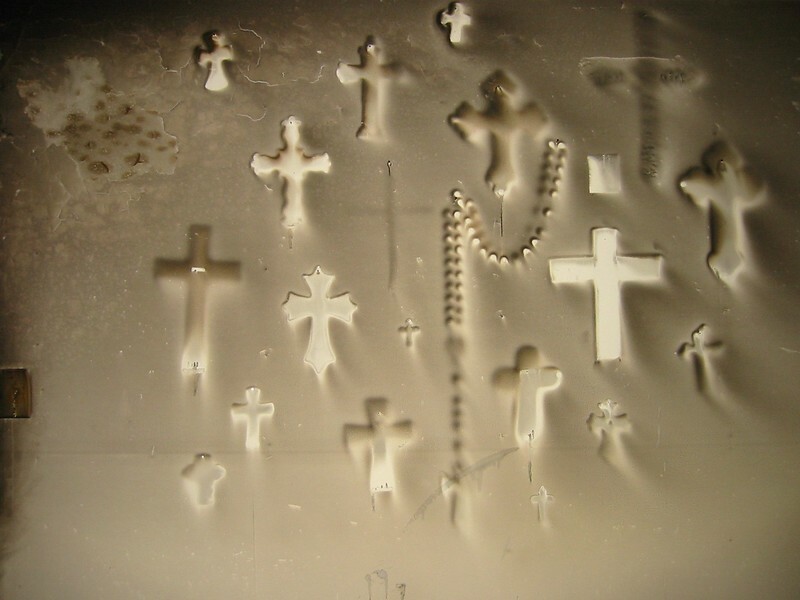 I have in my possession most of the crosses that hung on that wall. I had forgotten about the story behind this photo that my sister shared with me until recently when my mother passed away. So I contacted her to see if she still had the information of the person who took the picture and she sent me this link. I think its a beautiful pic and plan to purchase a copy to hang on the wall with the crosses that once covered that wall! Wow! Incredible photo. Very powerful indeed! This is incredible and you were fortunate to have been able to capture it! Thanks for posting and sharing! Great Story and Photo.My Dad has an AE-1.It is what I first used when I was young.Great Cameras. Hey Patrick, Alexandra here. I love this photo! What a story! The mom above......is my best friend! Maria! Can you contact me by email from my site, I'm having some trouble with pictures! I changed my name to fowler-photography.smugmug.com, from egan. That is AWESOME! Brilliant! Love It! Stunningly powerful photo and story. Beautiful.